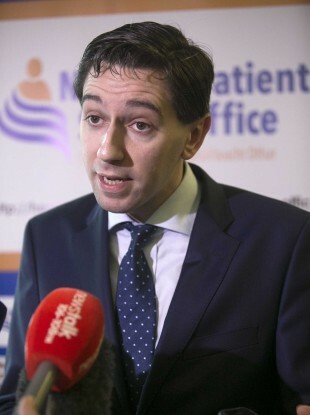 MINISTER FOR HEALTH Simon Harris has come out again to strongly defend the government’s decision to allow the new National Maternity Hospital to be built on land owned by religious group the Sisters of Charity. Addressing the annual general meeting of the Irish Medical Organisation, Harris said that, in this country, “doctors and healthcare professionals make clinical decisions – nobody else”. However, at the Labour Party national conference today, Joan Burton accused Harris of being “hapless, helpless and hopeless” on the issue. The question of a religious order owning a maternity hospital providing a range of services for women and children has been subject to severe scrutiny this week. To date, over 80,000 people have signed a petition calling on a block to be placed on the Sisters of Charity owning the new National Maternity Hospital. In a statement yesterday, the St Vincent’s Healthcare Group, of whom the Sisters of Charity are a major shareholder, said it would review the status of the current plans to build the new hospital there, following recent events. Minister Harris has repeatedly stressed that the hospital will be run independently and without any religious interference. However, this has done little to assuage doubters who have questioned why the government is allowing a private, religious entity own the land where the State has made an investment worth €300 million. In a wide ranging speech, Harris gave up a large portion to discuss the recent controversy surrounding the new maternity hospital. He began by saying that the current maternity hospital at Holles Street is “out of date, inadequate and not fit for purpose”. A new National Maternity Hospital is something that “women and infants in this country desperately need,” he said. Harris said that the “international norm” was to co-locate maternity hospitals with acute adult hospitals, which would be fulfilled with the new planned hospital. I am very committed to this project and I will work with all stakeholders to ensure that we do build this hospital. Yes, it’s complicated, and we must work together to address concerns that some people have expressed. The Minister said that “you can be absolutely sure” that he will put in place appropriate legal mechanisms that would protect the State’s interests and investment. He reiterated that the clinical, operational and financial independence of the new hospital would be “copper-fastened in new legal arrangements” which he will put in place. And lest there be any doubt – in this country, doctors and healthcare professionals make clinical decisions – nobody else. Concluding his remarks on the matter, Harris called for “cool heads”, said “we can do this” and added that the government could deliver a hospital that ensures the protection of the patient, the doctor and the taxpayer. Despite Harris’ attempts to reassure on the issue, there has been little let up from opposition parties in their criticism of his handling of the matter today. Speaking at the Labour Party’s national conference, Joan Burton said that people were confused at how “utterly bizarre these convoluted arguments are”. She said that “golden shares have proven in the past to be weak instruments of public control” and urged the Minister to make the agreement reached with St Vincent’s public. Burton said that Harris “appears hapless, helpless and hopeless” and had been “rolled over by a stronger and cleverer negotiating team on the opposite side of the table”. If I were writing a book, let’s call it ‘The Art of the Deal’, how amazing would it be to have a €300 million hospital project handed over to a religious congregation with the dodgy history on previous deals. Sinn Féin, meanwhile, said it was “absolute nonsense” that the Sisters of Charity be given ownership of the hospital simply because they own the land. The party health spokesperson Louise O’Reilly said that there were “many other options available to government”. “Minister Harris needs to act with the utmost urgency to sort this mess out,” she said. Email “Accused of being 'hapless, helpless and hopeless', Harris wants 'cool heads' on maternity hospital”. Feedback on “Accused of being 'hapless, helpless and hopeless', Harris wants 'cool heads' on maternity hospital”.